"Estuaries are areas partially surrounded by land where rivers meet the sea. They are characterized by varying degrees of salinity and complex water movements affected by ocean tides and river currents. They are also highly productive ecosystems with a range of habitats for many different species of plants and animals." 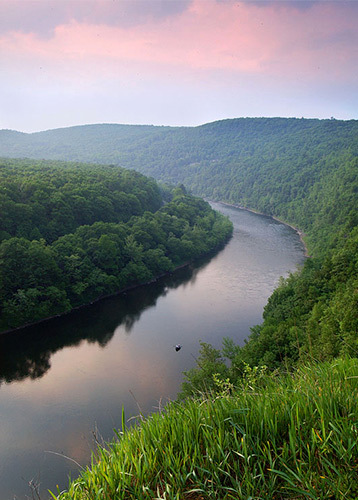 (Comprehensive Conservation and Management Plan for the Delaware Estuary Public Review Draft PA, Pg. 4, December 1994). The Delaware Estuary stretches 134 miles from the Trenton falls to the mouth of the Delaware Bay between Cape May, NJ and Cape Henlopen, DE. Approximately 8 million people live within the Delaware Estuary's watershed, many depend on it for food and drinking water. Numerous species of plants and animals, such as oysters, crabs, diamondback terrapins, duck and humpback whales thrive on the Estuary's highly productive ecosystem. The Delaware Estuary is also home to the world's largest horseshoe crab population and its 1.1. million acres of wetlands provide critical habitat for 35% of the region's threatened and endangered species, including the endangered ruseate tern and the threatened bald eagle and piping plover. As part of the Atlantic flyway, the Delaware Bay area is host to the second largest population of migrating shore birds in North America. Birds including Sanderlings, Sandpipers, Red Knots, Plovers and others arrive from South America to this area late may and use it as resting and feeding grounds. Migrating birds gain up to 50% of their body weight in fat by feasting on horseshoe crab eggs and submerged vegetation. The new body fat helps fuel the birds for the next part of their journey to the breeding grounds in the Arctic, a flight which may include non-stop distances as long as 3,000 miles. Researchers have found 1/3 of the total number of sanderlings that live in the western hemisphere on the beaches of Cape May and up to 70% of the North America Red Knots on the shores of the Delaware Bay on a single day. Oil spills and/or excess toxins can have devastating effects on horseshoe crabs and migrating bird populations. And overharvesting of horseshoe crabs in the Delaware Estuary has reached a precarious point -- spawning horseshoe crabs are no longer able to provide the quantity of eggs needed to support migrating shorebirds and as a result the Red Knot rufa is predicted to go extinct by the year 2010 unless strong and immediate action is taken. 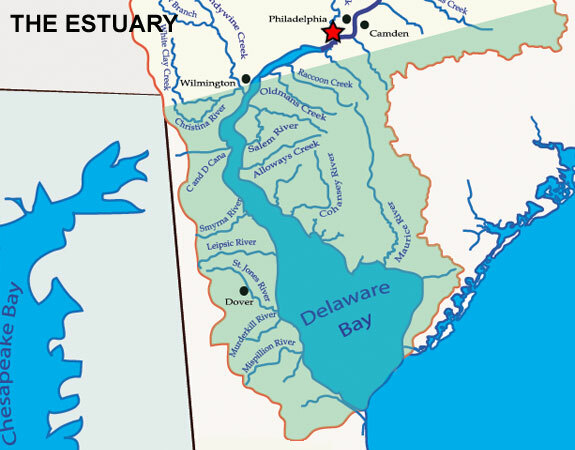 Industrially, the Delaware Estuary is also heavily used. The Estuary supports the world's largest freshwater port (Port of Philadelphia), and second largest refining petrochemical center in the US. With 70% of the oil that arrives on the Atlantic coast being transported through the Estuary there is a high risk for oil spills. Also heavy metals and organic contaminants from industry along the Estuary such as in the Philadelphia/Camden area, create high levels of toxic contaminants in the Estuary's sediment, water column, and aquatic animals. In the 1940s and 50s excess nutrients caused the River to become totally devoid of oxygen, side to side, top to bottom, for a 20 mile stretch in the Philadelphia/Camden area. As a result of fish such as the shad were unable to migrate upstream to their spawning grounds, they had to turn back or be suffocated. While the Delaware's nutrient problem has improved since the Clean Water Act was enacted in 1972, nitrogen and phosphorus continue to cause problems in many tributary streams. Toxics such as mercury, PCBs, chlorinated pesticides, dioxins and chlorinated benzenes continue to be a problem contaminating the food chain and fish. As a result of this toxic contamination, the Estuary states, New Jersey, Pennsylvania, and Delaware have all issued advisories for the consumption of fish. Many fish including the American eel, white perch, channel catfish, striped bass and white sucker are subject to no-eat fish advisories in many parts of the Estuary. Consumption of other fish such as chain pickerel, largemouth bass and bluefish are advised to be eaten in limited quantities. (Check Delaware Riverkeeper's Toxic Fish Alert for contaminated fish in your area or send us a self-addressed, stamped envelope to 300 Pond Street; Second Floor; Bristol, PA 19007 for your copy). The Delaware Estuary is a delicate and previous resource for plants, animals, and humans alike. We must preserve it and protect it as if our lives depended on it, because for many species it does. Click here to go back to the river facts page.